Please refer to our stock # T 1755 when inquiring. Quintessential Art Deco! 104 grams! At ~ 27", longer would be too heavy. 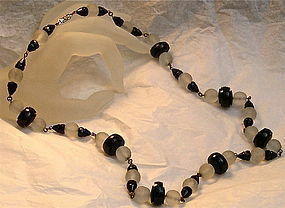 12mm frosted glass or crystal faceted beads resembling camphor glass, while the faceted "French jet" black beads are wafers, bicones, rhondells and 18mm discs for a very, very Art Deco look. These are wired in place; no cord here to break! Old filigree hook box clasp. Teenie flea bites ARE expected for this type of necklace and age. Perhaps this was once a 60" flapper (>200 grams!?) necklace, and the poor girl tiring of a painful, Quasimodo neck, had it shortened to 27"! Can you blame her?